WIND Level 8 ATK/2500 DEF/2000 [Dragon/Synchro/Effect] 1 Tuner + 1 or more non-Tuner monsters You can Tribute this card to negate the activation of a Spell Card, Trap Card, or Effect Monster’s effect that destroys a card(s) on the field, and destroy that card. If you negate an effect this way, you can Special Summon this card from your Graveyard during the End Phase. Stardust Dragon…one of the originals, and something that was beyond powerful long ago. While not as strong in ATK as its counterpart: Red Dragon Archfiend, Stardust was far better in terms of protection. When your opponent would bring Stardust to the field, you immediately knew you had to get rid of it. Pop to negate a destruction effect, then Special Summon itself back in the End Phase of either turn was a tremendous effect back then, and still is. Your opponent needed to beat Stardust in a battle or steal it and get rid of it that way, but with no Links back then or Xyx, you’d have to tribute it or finish your opponent (Mind Control locked you out of a tribute). Plenty of monsters could get over Stardust, but if you couldn’t, you were going to likely lose at least one card to negation. It had its own trap to accompany it as well: Starlight Road. Starlight Road negated a destruction of 2 or more cards, then Special Summoned Stardust without the need for materials. Sure, you couldn’t bring it back if it popped itself to negate, but that still got you another negation. Stardust also gave birth to Shooting Star Dragon and Shooting Quasar Dragon, two monsters that offer insane combo strategies to go with them. Stardust was on the ground floor of what Synchro monsters could be. It has withstood the test of time better than other Synchro monsters. Even in a world of Xyz and Link monsters, you may come across a Stardust because of that negation ability. Stardust Dragon is a beautiful generic Level 8 Wind Dragon-type Synchro Monster with 2500 Atk and 2000 Def. There isn’t much new to say about this card. Once it hits the field it can tribute itself to negate and destroy any card or effect that destroys a card or cards. If summoned properly, you can Special Summon it from the grave during the End Phase, and of course do it again if it’s threatened again. There are ways to utilize tuners to get a Level 8 Synchro even during Link Format. There are still many destruction effects, including itself. Stardust Dragon will always be relevant and never banned. There will probably more support down the line in addition to the combos and Synchro Ladders that can be climbed currently. Run Stardust Dragon in Dragon decks as it is still one of the best. Now we can look at an old Synchro that was good then and is good now. First released in the 2008 Wave 1 Tins, we have Stardust Dragon. Stardust Dragon is a Level 8 WIND Dragon Syncrho with 2500 ATK and 2000 DEF requiring one Tuner and one or more non-Tuner monsters. Stats are ok on a Level 8, this is the protagonist ace obviously, so it was gonna have 2500 ATK. Dragon is a great type, but WIND isn’t too great. During either player’s turn, when a card or effect is activated that would destroy a card(s) on the field, you can tribute this card to negate that activation and destroy that card, then revive Stardust Dragon during the End Phase from the GY when it uses this effect. Negating destruction is great and there are several good destruction cards still like a few Knightmares, Raigeki, Twin Twisters, etc. Stardust can negate all of that. Now with the Extra Monster Zone, you don’t have to feel bad about using it on a Stardust Dragon cause when it tributes itself and comes back, it goes to a Main Monster Zone, similar to how Omega works when it uses its effect. Stardust was a great first Synchro, being probably a 4.5/5 upon release, but with less effects to out cards without destruction, Stardust isn’t as good, but still pretty great compared to RDA and DSF to start this list, though DSF was due to errata. Art: 5/5 Ok, this is my favorite Signer Dragon. All of them look great, though. Honestly, for whatever reason, I felt that we’d looked at Stardust more than that, but alas, here we are. I”m glad to see Stardust here towards the top, (my #1 as you see at the top) but let’s look. Obviously, even if you weren’t an anime fan, you’re probably aware this was the trump card of Yusei, so the 2500 attack base is obvious (if low on a Level 8) but as I’m sure you’re aware, he makes up for it in his effects. Being able to sacrifice itself to negate destruction, and revive itself, made him…well, in a word, awesome. Stardust very likely could hold its own in the Yugioh world today. It’s not as easy to trigger the effect these days, yet, at the same time, there are more ways to do so. Even if, perhaps, there are less commonly played ways in the meta that do so. I’d absolutely be playing Stardust if I were playing Dragons, at the very least anyway. Art: 5/5 Definitely the best of signer Dragons, and one of the best Synchro arts we have period. This was one of the very first good Synchro monsters that came out. While not necessarily overpowered, it did require decks to play around it (with cards such as Dimension Prison instead of Mirror Force). As the meta evolved, non-destruction based monster removal became more common. 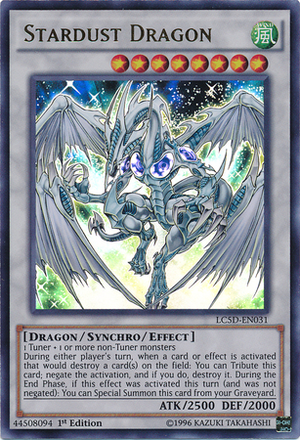 Better Synchro’s came out, but Stardust Dragon, for a very long time remained one of the top picks for the Extra Deck due to the fact that apart from being a soft-lockdown card, it was harder to minus off of than to plus off of. This card really brings some good memories back. requirements: denying a card that “destroys”. On the battle side Its stats made yusei’s ace card really hard to kill (2500 ATK in an era of monarchs with 2400ATK was nothing to scolf at). I recall it was a recurring summon in the dreaded tele-dad, really easy to access with cards like emergency teleport. Being an ace card from the main character of the anime (curiosly dark magician, elemental hero neos, stardust dragon, number 39: utopia, odd eyes dragon and firewall dragon all share the same stats) , this card would get extra support, some even considered competitive like starlight road. It was a staple card, for a very long time, just as goyo guardian was. If you were lucky enough, you’d get the amazing ghost rare version or the not so fancy version, but then the tins made it more accessible everywhere (I write this from a southamerican view, peruvian to be more accurate). This protection against destruction made players look for ways to remove cards without destroying them, because of this players became more resourceful and innovative. Yu-gi-oh! was great back in those days! The game then became faster and new summon mechanic gained momentum and popularity. Synchro monsters would never take that many slots in an extra deck again (except in specific synchro oriented builds). Fast forward to our 2018 link era, and I cant remember the last time I saw this card in play in the current competitive scene (the most played synchro now is for sure Psy-Framelord Omega). In spite of that, with the new extra zones, this card has the same particularity as the before mentioned card: if summoned to that solitaire slot, and its effect resolves, when it comes back, he’ll do it in the main monster zone. I Hope to see this card shine again! (Maybe with new support?) and have an excuse to use the very special ghost version. Very special thanks for reading pojo!!! Advanced : 2.5/5- good in the old days, but many better options available in 2018! Art : 3.5/5 a main character’s ace card, great details and a favorite of konami for event posters!